Driven by technically advanced facilities at our ultra-modern production unit, we are presenting Stone Bath Tub. Richly carved in oval shape, these stone bath tubs are ideal to give a magical face lift to the decor of bathroom. These Granite stone bathtubs are highly popular amidst the elites. 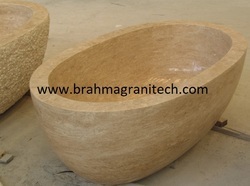 From our wide consignment, we are affianced in supplying Granite Bathtub.